If you’re a foodie, there may come a time when you experience something whose flavour is so remarkable that words fail you, hyperbole becomes actual reality, and taste feels like a revelation. That is what happened to me the first time I tried one of Mandy Aftel‘s Chef’s Essences. My eyes grew wide, words didn’t come out in full sentences, and I felt a mixture of awe and disbelief. I know it sounds like an exaggeration but it’s not, and I mean it with absolute sincerity. Some of Mandy Aftel’s Chef’s Essences rocked my (food) world, and I think they’re pure genius. I’m not the only one. Ms. Aftel’s creations are used in the White House, as well as some of the top restaurants in the world. The Collection is an extensive one, with 15 essential sprays and over 50 essential oils, ranging from basic items like Black Pepper and Cinnamon to funky things like Peru Balsam, Frankincense, Fir Needles, Ylang-Ylang, Magnolia, and Violets. I’ve tried 11 of them now and wanted to share my experiences with you, covering what exactly they are, why they are a remarkable invention, how you can use them, and some of my adventures (or misadventures in a few cases). The ones I’ve tested are: Rose, Ginger, Blood Orange, Pear, Cognac, Cepes (Porcini Mushrooms), Chocolate, Tarragon, Sweet Basil, Coriander Leaf (Cilantro), and Pink Pepper. Today, I’ll start with a background explanation and introduction, then focus on 5 of the Essences: the Ginger, Sweet Basil, Rose Absolute, Blood Orange, and Pear. The remainder will be covered in Part II. 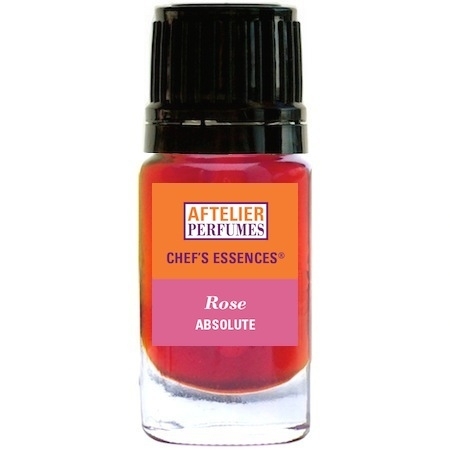 Rose Absolute Chef Essence via Aftelier. Heston Blumenthal’s Mango, Lychee and Douglas Fir Mousse at The Fat Duck. Photo: Alison McDougall. Source: Daily Mail. The essences were created by Ms. Aftel in conjunction with a Michelin-starred chef, Daniel Patterson of San Francisco’s famous Coi. 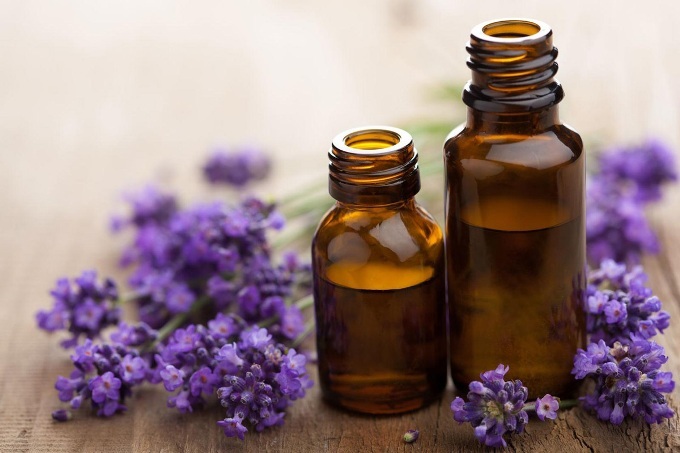 Together, they wrote the 2004 cookbook “Aroma: The Magic of Essential Oils in Foods and Fragrance.” The Essences seem to have been released around the same time. Their amazing vibrancy and super-saturated flavour has impressed some of the best chefs in the world — to the point that Bon Appétit magazine calls Ms. Aftel “a flavor-dealer to the stars.” Her Chef Essences are used at The White House, Grant Achatz‘s famous Next, Thomas Keller‘s world-renowned The French Laundry, José Andres‘ restaurants, Chez Panisse, and others. According to a 2005 New York Times article entitled “Of the Essence,” England’s legendary Heston Blumenthal uses Aftelier’s essence of Douglas Fir in his mango and lychee mousse at The Fat Duck, while “Dan Barber, the chef of Blue Hill in New York, makes a mushroom consomme with porcini oil, and a citrus broth for crab salad using blood orange oil.” The former White House Pastry Chef Bill Yosses relied on them too. He told MSNBC that he uses the essences in meringues. 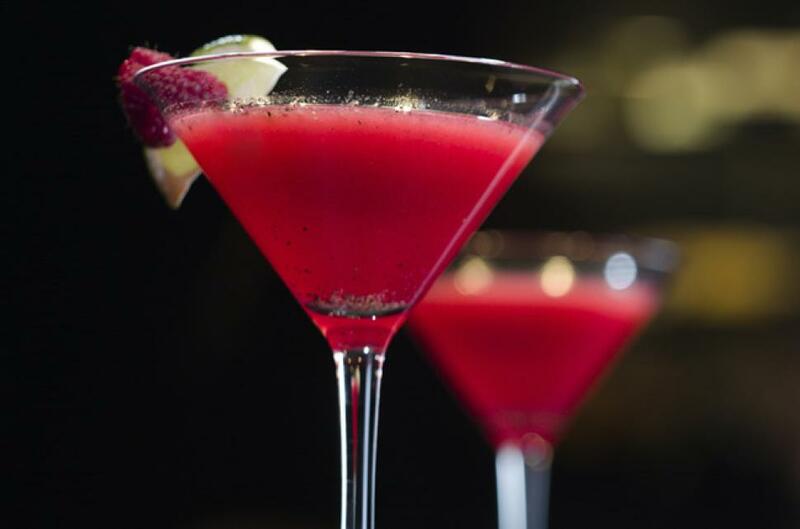 believe the scents add one more dimension to the multisensory experience of a good drink. [¶] Even purist New York mixologists like Audrey Saunders and Jim Meehan, who say they would never reach for any ingredient that was synthetic or stale, are pouring Ms. Aftel’s products into their potions. After all, the powerful aromas and tastes are drawn from the botanical world and not from the flavor and fragrance suitcase. […][¶] [W]hen using scents for flavor, why use a distillation of something as common as black pepper or ginger, when you can reach for a grinder, grater or muddler? Originally, Ms. Aftel sent me Ginger and Sweet Basil in spray form, as well as the Tarragon in essential oil drops. Just a sniff of the Ginger in the bottle astonished me, while a spray on the tongue made my head spin in circles. (Yes, I sprayed right into my mouth, which may have been a little foolhardy in hindsight, but so worth it for the Ginger!) The same for the Basil. A single spray felt as though thousands of basil bunches had been reduced down to their most concentrated essence, but it was astonishingly fresh, bright, and visually glowing like an emerald. I actually cannot describe it in any way that would do it proper justice; I could use every form of hyperbole imaginable, but none of it would properly capture just how super-saturated the taste is or how vivid. To borrow the New York Times‘ description for the flavour of Aftelier’s Black Pepper in a cocktail, it was “so intense it was a little shocking.” I think that summarizes a few of the fragrant oils, though not all. Their intensity is such that a little generally goes a long way. I needed only a few, tiny drops of the tarragon to flavour a large pot of stew, while chefs in various newspaper articles say they use eye-droppers to dilute out a tiny portion in a large quantity of liquid. The sprays, however, seem a hair less concentrated or intense, though the flavour is still very rich. I also found them a little easier to use in terms of handling the quantities or amounts. One reason may be because of the fact that they were not as forceful in flavour, but another may be due to personal taste issues. I don’t mind an excess of ginger, so I felt comfortable risking over-spraying the element, whereas tarragon is a trickier flavour in large quantities so I had to be more careful in terms of just how many drops I used. The Original Chef Essences Set, though there are far, far more now. Source: Aftelier. 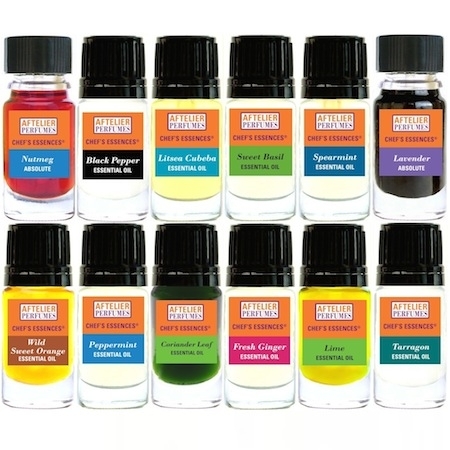 In the last eight months or so, I’ve used the three Chef Essences quite a bit in cooking, and was really curious about the other flavours, but I didn’t know where to start. As I noted earlier, the full collection is very large, with over 50 different kinds of the drop versions or oils alone. 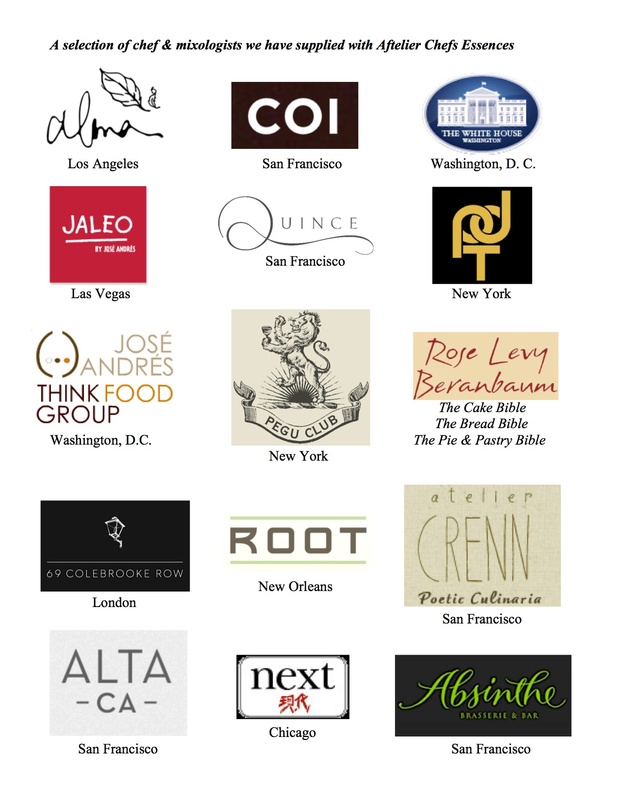 I knew that I couldn’t be the only one who felt a little overwhelmed by the selection, and who might be interested in a small explanation of what some of the Essences tasted like, so I wrote to Ms. Aftel to inquire if there was any way I could test a few others for a more complete review. My goal was not to obtain free bottles, though, so I asked if it were possible to have small samples made up. Left to Right: Full-bottle sprays; a regular Chef Essence Oil in Tarragon; then my 4 samples sprays and the 4 mini oils on the far right. Photo: my own. Ms. Aftel graciously and very kindly agreed, creating the most adorable minis of four sprays and four essential oils. Several were flavours that I had specifically mentioned being interested in, while others were things that Ms. Aftel thought I would enjoy. The entry page for each one on the Aftelier website has recipes links, but Ms. Aftel also gave me some tips for their use, like how some of them could be dripped or sprayed over ice-cream. (In fact, Ms. Aftel has an actual “Ice Cream Set” of certain Chef Essences that are particularly well-suited for ice-cream.) So, the first thing I did was to go to the super-market with a shopping list, then get to testing. I thought I would walk you through my experiences — starting today with Ginger, Sweet Basil, Rose Absolute, Blood Orange, and, finally, Pear — but I have to make a few things clear first: I am not a food blogger; I am most definitely not a baker; and I take simply ghastly photos of food in general. (Even with restaurant food!) So, you’re not going to see a ton of photos of my end results. I tried on a few occasions, but I fear I didn’t do much justice to the outcome; none of my images conveys just how good something can taste with a Chef Essence. I’m even more hopeless when it comes to baking, so that limited some of my testing options. Finally, I don’t drink a lot, so there was no way that I was going to test out 11 different Chef Essences in multiple cocktails variations. (I would probably have ended up in the hospital with alcohol poisoning if I had.) I hope you will keep these limitations in mind, because there is a lot more you can do than what I came up with. The Ginger Essence spray is one of my absolute favorites from the line, in large part because I adore Asian cuisine and the ingredient is such a staple in its dishes. Ms. Aftel had suggested using it in tea, but I’m not a tea drinker, so I went straight for a stir-fry as a first test. I tried two sprays during cooking in one try, then later used it as a final, finishing touch instead. Regardless of when I timed its use or applied it, it made no difference to the flavour which remained intense, fresh, and bright. 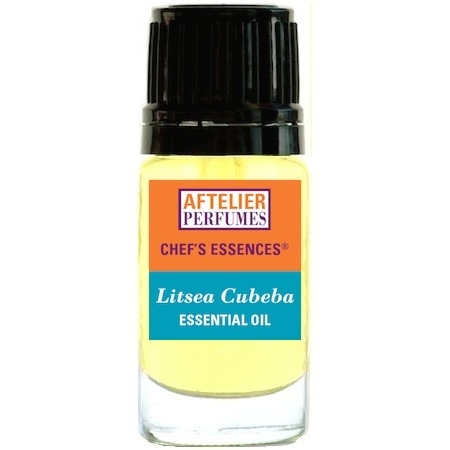 This is definitely one of the fool-proof Chef Essences that can be used without undergoing an actual cooking process and which can simply be sprayed on a dish. 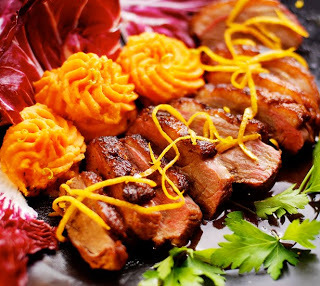 The flavour is incredibly bold, and has worked brilliantly when used in: countless fried rice dishes; as a final touch on top of Vietnamese Pho soup; in dumpling dipping sauces; as part of a honey-miso glaze for salmon; and on chocolate ice-cream. Shrimp fried dumplings and asian dipping sauce. Photo and source: seductionmeals.com (website link to page with recipe embedded within). In general, the quantity I use depends on the quantity of food I am preparing. To give you an idea, I keep about a cup’s worth of Asian dipping sauce in the fridge, made up of sesame oil, rice vinegar, green onions, and soy sauce. For that amount, I used 2 to 3 sprays of the Ginger Chef Essence, but I like a lot of ginger, so I suspect most people would be happy with a smaller amount. In contrast, a dinner plate of fried rice only needed one spray, and that was just bordering on overpowering the rest of the flavours. 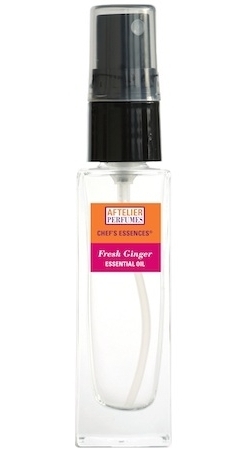 Fresh Ginger spray via Aftelier. Each Chef Essence spray bottle comes with about 230+ sprays, and their prices vary. The Ginger spray costs $22. As I’ve said earlier, the intensity of some of the Essences means a little goes a long way. Eight months of constant, weekly use has depleted my bottle by about one-eighth, which makes me think that I may have another 12-14 months to go, but I’m rather an extreme case given how much ginger I use. Unless you’re the same way, I suspect that most of the Chef Essence full bottles will last you a good number of years. (As a side note, the majority of the essences keep indefinitely at room temperature and don’t go bad, though the citrus ones have to be refrigerated.) In short, the Ginger is pretty economical, financially speaking, and the flavour is simply magnificent. It’s one of the more versatile Essences (tea, sauces, cocktails, and desserts), too, and it’s pretty idiot-proof to use. I recommend this one very, very strongly. An explosion of green with an astonishing freshness that feels as though you went out to a herb garden, picked every bit of basil there, amplified their flavour by a thousand, and then reduced it down to a concentrated spray. That’s the Sweet Basil Chef Essence in a nutshell. It’s a fantastic item that brings a pop of enormous boldness to every dish, as well as a lovely, lingering fragrancy. When I tried a spray on Vietnamese Pho soup, it seemed to make all the other flavour bloom as well, but the aromatic touch is really what made the Pho taste more special than usual. Food is about smell almost as much as taste, and the Basil Chef Essence is one which works particularly well in this regard. The Basil is another one of the Essences that is incredibly easy to use. It doesn’t need the heating process, and is quite versatile. I added it as a finishing touch on an Italian Caprese salad; used it in sauces; found it great with lighter proteins; and even sprayed it on frozen pizza before putting it in the oven. It is basically perfect for everything that you would normally use basil in, only better than anything you would ever find in a supermarket. Turkish roses lie at the heart of this Absolute, one of the Aftelier oils, and the result is beautiful. I don’t really have the words to explain just how well the Rose Absolute works with vanilla ice-cream. It’s so incredibly rich, and with a beautiful (but wholly natural-smelling) floral aroma that lingers in your nostrils as the flower melts into the ice-cream. Every mouthful was pure decadence. Blood Orange Rose Madeira Sauce. Photo and Source: Lost Past Remembered blogspot. I have a bottle of Middle Eastern Rose Syrup in my larder and I’ve used it in the past in drinks or an occasional dessert sauce, but it’s nothing like the Aftelier Essence. 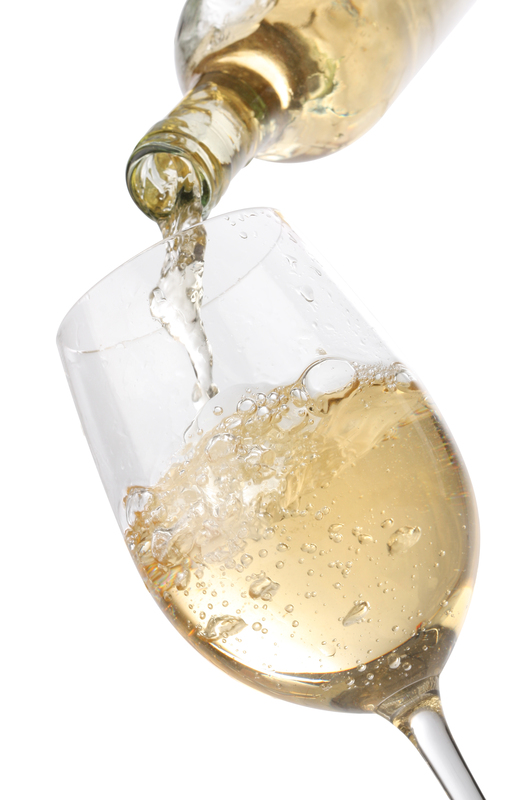 It’s heavily sugared, almost cloying sweet, and with a fructose-like undertone. With Ms. Aftel’s Rose Absolute, however, you only experience a heady richness that feels like pure rose jelly. It swirls perfectly with vanilla, though I noticed that one of the recipes listed on the Aftelier website is: “Spiced Rose Chocolate Pudding.” I don’t make or cook desserts, so I desperately wish someone would make that for me. Instead, I plan to try the recipe for “Duck with Orange Rose Madeira Sauce,” since I do something similar with pork tenderloin. The blog, Lost Past Remembered, made the dish for Valentine’s Day with two drops of the Rose Absolute, and the photos look amazing! You can check out the link for the recipe. The Rose Absolute is one of the few, really expensive Chef Essences at $54 for a 5 ml bottle, but there are about 150 drops worth in each one. It’s one of those decadent indulgences that a foodie or true chef would really love, so keep it in mind for Christmas if you happen to have a one in the family. The Blood Orange vies with the Ginger as my favorite Chef Essence. It is simply outstanding! I received a mini-spray and I’ve almost used all of it up in a short time. Quite simply, everything seems to taste better with it. The Aftelier website describes it as an “Essential Oil from Israel” with the “luscious aroma of oranges and raspberries,” but I think its taste is far more than what those words convey. It’s tart, tangy, zesty, bold, and a kaleidoscope of brightness that visually skews orange and crimson-red and whose taste takes over everything, while the intoxicating aroma weaves its way around every bite. The smell, my God, the smell! I’ve basically tried the Blood Orange in everything I could with the quantity available to me, but I have to start with the ice-cream. If the Rose Absolute was delicious on ice-cream, the Blood Orange was even better. I blinked when I tried it on vanilla ice-cream, but chocolate is where it’s the real star, in my opinion. A basic, simply okay chocolate ice-cream turned into something rich, riveting, and complex. Using two tiny sprays (and my minis put out less than the regular bottles) on about 3 tablespoons, the bland, rather tasteless, generic store brand suddenly tasted like something close to the famous dark chocolate with blood orange that is the speciality of the best gourmet ice-cream place in my city. But when I sprayed the Aftelier Blood Orange onto an expensive, dark chocolate ice-cream, my only description is the very unprofessional but honest: “OH.MY.GOD.” I think my eyes rolled backwards in my head. The taste was jaw-dropping, stunning, and I’m swallowing my saliva at the mere memory of it. 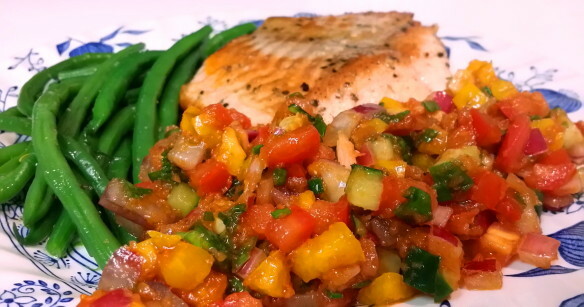 Salmon with mango salsa. Photo: my own. The Blood Orange also worked really well in everything from: chicken salad; mango salsa with salmon; chocolate cognac cookies; plain yoghurt with granola; balsamic reduction sauces; and even coffee. Finally, it added the perfect touch of brightness, zestiness, and counter-balancing acidity to a cooked fruit and nut stuffing that I used inside a pork tenderloin roulade with port, and I think it would do wonders for Thanksgiving stuffing as well. 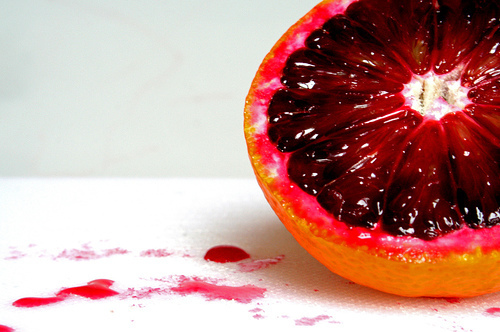 Obviously, you have to love a citrus, fruity component in your savory dishes, but I think the Blood Orange would be superb in desserts and cocktails as well. In fact, a blogger called DocSconz tried, tested, and experimented with numerous Aftelier sprays in drinks and apparently came up with something called Rosemary’s Baby Cocktail for the Blood Orange one. Alas, I couldn’t find an accompanying recipe, but I love the name. Other drink ideas would be a Campari, Negroni, or Christmas mulled wine. Bottom-line, I strongly recommend the Blood Orange spray. It costs $18, and is worth every penny, in my opinion. (It also comes in the drop oil form, but I think the sprays are easier to use.) If you order it, I beg of you to try it first on dark chocolate ice-cream. Trust me, it will blow your mind. 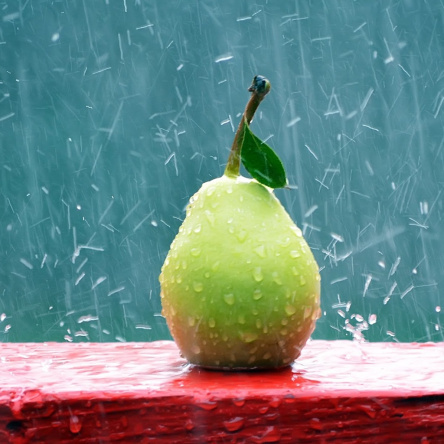 The Pear Chef Essence is described on the Aftelier website as: “An artful blend of 100% natural isolates that may also include fruit extracts and essential oils. Smells like sweet, ripe pears.” I thought it had a cool, dewy, nectar-like taste that was sweet but also very bright and surprisingly floral. Equally surprising, it has rather a nutty nuance that reminds me a little of bitter almonds, though it’s very subtle. I loved the Pear Chef Essence on vanilla ice-cream and plain yoghurt, but I had less success using it in cooking. While it was nice in a few sauces and in a very light broth to accompany chicken, the taste was quite subtle at times, unless I applied quite a few sprays. At times, the floral aroma seemed stronger than the actual flavour in certain dishes. In fact, I thought that the taste was over-powered or completely lost in anything too dark, rich, heavy or spiced, perhaps because it’s not vivid or bold like some of the other Chef Essences. I found that it worked best in conjunction with creamy things (ice-cream! ), but I suspect it would be fantastic in desserts as well. Finally, I found that its delicate aroma provided a great touch to otherwise pedestrian white wine. I followed what some of the mixologists in the NYT article talked about, which is to spritz the inside of a chilled glass with the Essence spray and then pour in the alcohol. They love to add the floral Chef Essences to cocktails, but I thought a tiny bit of the Pear really amplified or augmented an otherwise dry, inexpensive chardonnay, because it added a some depth and fragrancy to it. I think everyone with an interest in cooking, baking, or fun cocktails should try out the Aftelier Chef Essences. Not all of them worked for me, as you will see in Part II, but the very definition of “personal taste” comes from the food realm. Some flavours will simply be a matter of individual preference. (None more so perhaps than Cilantro, which is otherwise known as Coriander Leaf. It will be part of the next review, along with Pink Peppercorn which I have now realised is a taste I loathe.) Yet, when a flavour is to your liking, there is absolutely nothing to top the Aftelier Chef’s Essence version of it. Even better, many of the Essences are very economical for use. Where I live, a bunch of fresh basil costs about $4. Aftelier’s 30 ml spray bottle of Sweet Basil costs $18; tastes as though 10 of those bunches were reduced down in each spray; and there are roughly 230+ sprays per bottle. The math seems rather clear. Only a rare handful are really expensive, like the Rose Absolute, which makes them more like a decadent indulgence, but everything else is value for your money. I only wished that Ms. Aftel offered actual minis like the ones she made for me. Even if it ended up costing more on a per ml basis, I would prefer to go that route for some of the more exotic ingredients because it would give me the chance to see if I liked the flavour or could figure out how to use it. Peru Balsam resin in food? Frankincense? How would I do it?! I know that there is a Pinterest board for Aftelier Food Recipes and one for Aftelier Drink Recipes to offer some guidance, but I’m still gun-shy about buying blindly. For such things, I’d like to test them first, even if it cost me $2 or $3 for a sample when the full bottle cost $12 or $22. Plus, such samples would enable me to test more of the line which is really enormously large. Ms. Aftel provides samples of her perfumes and hair elixirs, so perhaps the Chef Essences could be next? I really hope some of you will try the Chef Essences, and that my two-part piece will make it easier for you to choose which ones. (I strongly suggest starting with the Blood Orange and Ginger!) I also think the Chef Essences will make wonderful gifts for the foodie in your life, so you may want to keep that in mind when you do your holiday shopping. As a side note, Ms. Aftel has a new book out called Fragrant: The Secret Life of Scent, which covers the history of cinnamon, mint, frankincense, ambergris, and jasmine, and reportedly also offers a few recipes and cooking tips as well. The book has received rave reviews from Vanity Fair, Time, and such culinary leaders as Alice Waters and Harold McGee, so it may be a good companion to trying out those Chef Essences in the kitchen. Next time, in Part II, a look at the Pink Peppercorn, Cepes, Cognac, Coriander Leaf, Tarragon and Chocolate Chef’s Essences, and my misadventures in trying to bake…. Disclosure: My sample minis or bottles were kindly provided by Aftelier Perfumes. That did not impact this review. I do not do paid reviews, and my opinions are my own. Cost & Availability: The Chef Essences are exclusive to Ms. Aftel and her website. She ships worldwide. The Essences vary in price, depending on the particular ingredient, and whether you’re buying the spray version or the drops. The Chef Essence drops come in 5 ml bottles, and each bottle contains roughly the equivalent of 150 drops. For the most part, prices are between $12 and $25, with a few exceptions (like the roses, the cepes, the vanilla, or the super-expensive jasmine sambac which is one of the most expensive perfume oils in general). 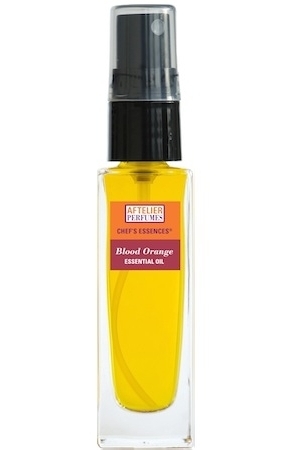 The Blood Orange oil, for example, costs $12, while the Pear oil is $22. 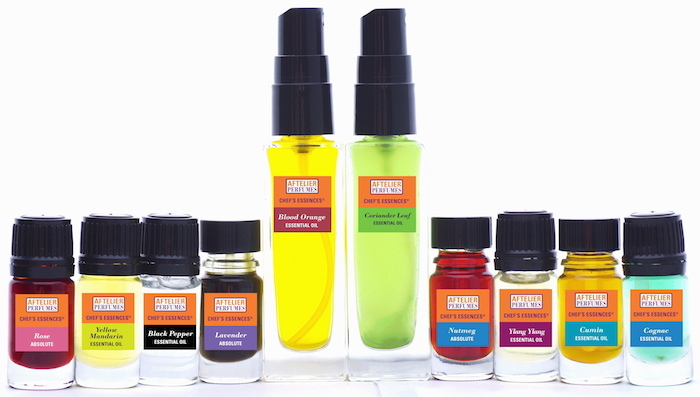 The Chef Essence Sprays are 30 ml in size, and each one has about 230+ sprays per bottle. There are 15 different kinds, with their price varying from $14 to $24. For example, the Fresh Ginger is $22, while the Blood Orange and Basil are each $18. I think each bottle would last you a few years, depending on frequency of use. There are also Chef Essence Kits in different sizes and quantities where the price is less than if you bought the same essences individually. The kits vary in price from $80 for a Basic Set, to $145 for the Exotic Set (full value of $161) or $179 for the full set of the original 12 essences (full value $191). There is also a 6-pack of the most popular ones used in conjunction with ice-cream. It costs $90, but is a $102 value. This entry was posted in Aftelier Perfumes, Food & Gastronomy and tagged Aftel Chef Essences, Aftelier Chef Essence, Aftelier Perfumes, Blood Orange Essence, Chef Essence, Chef Essences, Fragrant Oils, Ginger Essence, Mandy Aftel, Pear Essence, Rose Absolute Essential Oil, Sweet Basil Essence by Kafkaesque. Bookmark the permalink. It was definitely long! lol. 11 products really tested my planned hope of keeping things shorter, but that’s the difficulty with covering a collection. It would have been even worse if I had reviewed all 11 in one post! 😉 The next one involves 6 Chef Essences, so it’s several thousand words already, I’m afraid. Worries aside – looking forward to part II! I am glad you are back and well Kafkaesque, thank you for your work! Lots of kisses licks from you know whom, for you and the handsome German. Often wearing Roberto Cavalli as a soft happy hum in the background, thank you for this lovely lemming. I’ve been on the look-out for affordable lemmings that you might like. I may have one that I will post about in a few weeks. I have some new releases to tackle in the meantime, but just know that I’ve been thinking of you. Thank you Kafkaesque, that is very good to know (the affordable lemmings in a few weeks). I must say my negotiations with Angela have resulted in no more immediate must NOW outings…we agree on 8.00 every morning, and then ofcourse many more during the day. We had another very good training session in Belgium (I think I told you about this excellent method), where Angela has learned left and right, counting till 3 she can already do, and she understands a fair amount of Dutch. So I think we can safely say we have a relationship of give and take! As for my boy and his demands, one of my difficulties is that he is on steroids for a skin infection, and the medication makes him drink a huge amount of water and increases urination. So I can’t keep to a schedule the way I normally would, or else there may be some dire accidents that would be beyond his control. He gets a lot of skin infections, unfortunately, due to allergies and it’s gotten to the point where I have to have him on a special vegan diet to try to keep them under control. He’s my first German with skin/allergy issues, and it’s a massive pain! (Steroid regimens are the absolute worst. Ugh.) I never realised before now how common skin issues are in GSDs, along with the Hip Dysplasia which — unfortunately — my boy has, too. 🙁 I really hope your girl never has anything like that, but especially the Hip Dysplasia. Wow! When I saw that your first post back was not a perfume review, I was a bit disappointed. Well, aren’t I the fool?!! I’ve known Mandy Aftel made these but had never once looked at the pages on her website. This review came just in time for me because I’ve just recently started cooking Asian food again. Like you, I can’t get enough ginger, so I’ll be getting that. And she’s got Thai Lime!!! I can’t find any where I live, so there’s another one I”ll be getting. And lastly, basil. I am oddly allergic to it, but I can eat it cooked, so preparing it is a problem. Now the problem is solved!!! I’m so excited. Thanks so much for reviewing these! I can barely wait for part II, but I may order before that. Heh, it is technically fragrance of … er… some sort of another. 😉 As for the length of the post, I’m justifying it in my mind as 5 reviews, not one. It’s the only way I can defend my next one, or Part II. LOL. But yes, I did enjoy writing it. Food (as you will see in the Part II) means far more to me than perfume. You wrote last time that you were surprised to learn that perfume wasn’t my consuming passion in life, but it never has been, you know. The problem is that my real loves are neither affordable, practical, or easy/simple to write about. There is simply no way that I could focus on my real passion in life without having a multi-millionaire’s play-money budget. Anyway, onto the Chef Essences. 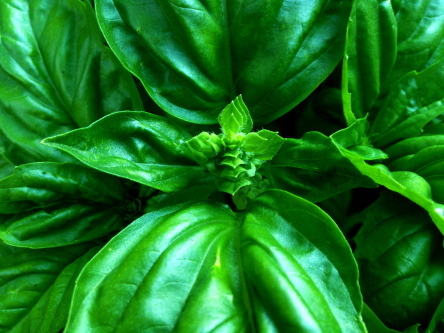 How great about the Basil being a likely solution to your allergy issue!!! I think it would be absolutely fantastic if that works out. Is the problem in terms of it touching your skin? Will you let me know how it all works out if you get the Chef Essence? As for cooking Asian food, I’m terrible at it, but I bet you’re brilliant after all your experiences and your ex. 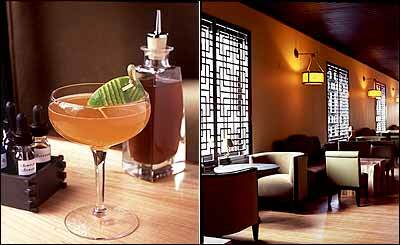 I can’t wait to see what you think of the Thai Lime and the Ginger. The Lemongrass is the one I have my eye on next, especially as it comes in spray form as well as drops, and I find the sprays so much easier to use. In terms of waiting for Part II, or just going ahead and ordering now, I don’t know if any of the ones in that section will be quite as exciting to you as the 3 that you’ve found already. I honestly can’t see you enjoying the Cepes (to give one example), but the Cognac and Chocolate may be possibilities. I like cepes, but I prefer cooking with real mushrooms. I’m planning on getting ginger, thai lime (!!! ), basil, and coriander leaf. Those will all be quite useful for Asian cooking. I wish they all came in spray form, but they don’t. I don’t bake (except for the occasional crusty boule) and I don’t drink, so the sweet essences have no place in my life. I learned most of my cooking skills from my mother. Her advice? Make sure there’s a good selection of colors and that they stay vibrant. Taste and smell. If it doesn’t look or smell good, it probably won’t taste good. There are exceptions, of course. I would love to know what your real loves in life are! I’m sure we’re all dying to know, lol! And I will wait to order until your post is up. I’m in no hurry. I chop a lot of ginger every evening! I never wear ginger scents, come to think of it. Oh, and as for the basil, I wouldn’t doubt I’d get a little thick lidded from putting the bottle up to my nose, but it goes away fairly quickly. I just can’t tolerate getting the oils on my hands or being around a lot of fresh basil. My loss. No pesto for me! I should hope food means more to you than perfume! It does to me, too. But, I haven’t been cooking as much as I used to and the restaurants where I live are generally awful, so my enthusiasm has waned. I should stop rambling! Looking forward to your next post! Heh, the Thai Lime really has you excited, and I’m so happy about that. Really am. You clearly share my excitement over ingredients, though you are WAY, WAY more committed than I am if you’re chopping a lot of fresh ginger every night. I’m far too lazy for that. LOL. Before I got the Aftelier Ginger Essence, there was a good concentrated paste that I was using and which one keeps refridgerated to maintain freshness, but it leaves fibrous remnants that I don’t like. And its taste is nothing as compared to the Aftelier one. Not as clean, bright or bold. With regard to the sweet(er) essences, you may not drink alcohol but they would still be great in things like tea, lattes, smoothies, or some sauces. The Chocolate one, as you saw in Part II, is not sweetened at all, but it can involve a little bit of a learning curve. The ones I have my eye on are the Tolu Balsam and the Fir Absolute. That last one has me quite obsessed actually because its description is: “Jammy sweet and intense, fir absolute is like a walk through the aromatic forest” http://www.aftelier.com/Fir-Absolute-Chef-s-Essence-p/chefs-firabsolute.htm. 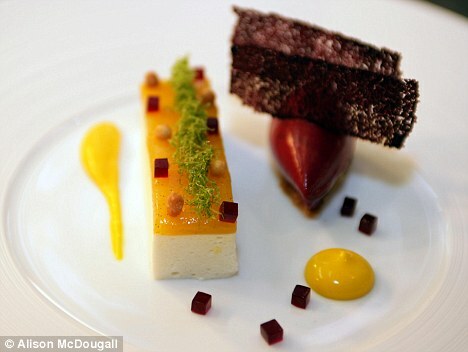 Plus, Heston Blumenthal used it with fruits and things. I think it sounds like it could go really well with beef, pork, or duck, in large part because it sounds aromatic as well as “jammy sweet.” I just wish Ms. Aftel offered samples of these things, because it would make me feel much more comfortable in venturing outside my usual parameters. I sympathize enormously. It’s really difficult to find authentic Chinese food near me, too, alas. There is a large Chinatown but the food is middling at the vast majority of places. I was lucky to spend almost a month in China, to have *real* Chinese food, and not this Chinese-American rubbish that so many places put out, so it’s been a bit of a frustration for me, as well. You know what I love, though? Trader Joe’s Asian dumpling stuff. (Do you have a Trader Joe’s in your neck of the woods?) They’ve got wonderful Shu Mai (oh so good! ), decent pork buns, good Gyozas, and several other things — all in their frozen food section. I buy a ton of it and, without exaggeration, eat Asian food at least three times a week as a result. It may not be as good as the real thing, but it’s pretty damn good (for 4-minute microwave cooking). And you can’t beat the convenience of not having to go out. lol. You’ll have to let me know what your friend thinks of the Ginger spray. It’s far better than any regular Ginger concentrate or paste that I’ve ever used before, so fingers crossed that she likes it as well. I wonder what the Peru balsam could do to a homemade hot chocolate. Or a chocolate cake. And call me weird but frankincense ‘could’ work for pasta dishes?! I would never call you weird but, rather, creative! I like that. What were you thinking for the frankincense and pasta? A way of adding some edge and counterbalancing acidity to a marina sauce, for example? I think that could be fantastic, you know. What always mixes me up, though, is that, in my mind, the Frankincense Chef Essence always seems like it should be about smoke, like incense, instead of a fresh lemony flavour. My mind doesn’t think lemony when I think of frankincense. As for the Peru Balsam, I looked back at the description of it again (“like a sweet, balsamic vanilla syrup”), and I think that sounds like it would work amazingly well with a chocolate cake! You know, it could really work well with bread puddings or tiramisu, too. Gosh, I wish I made desserts. As you will see in the next review, it is not my forte AT ALL and my attempts rarely turn out as they are supposed to. Perhaps I can live vicariously through you, if you end up trying any of these? I’d love to hear about any of your culinary adventures with them, especially with regard to the Frankincense in pasta dishes. I don’t know what I enjoyed reading more; your descriptions of the essences or the dishes you prepared. Yumm! I don’t really enjoy cooking but I can see myself using the blood orange spray on my yogurt, dark chocolate ice cream, & coffee. I happen to love cilantro, esp. in beans, so the coriander spray/oil is another spray I’d use. 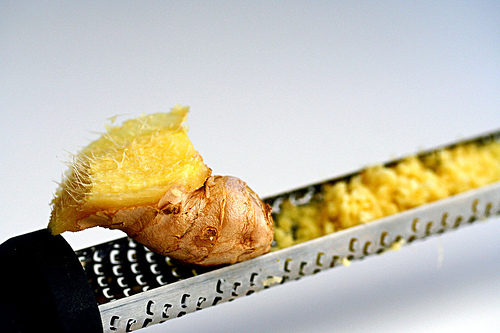 Ginger is good to take when you feel a sore throat or cold coming on. I wonder if the spray would have the same effect? I don’t know about the Peru balsam, but Marie Antoinette took ambergris in her coffee, so I suppose the frankincense or balsam might be something I’d be willing to try. They sound so good & I”m looking forward to part !!. I can ABSOLUTELY see you using the Blood Orange spray on your yoghurt and granola, Ed! And that’s the good thing about the sprays, they’re so easy to use. No fuss, and no cooking really required. The Cilantro one, though… you may want to wait for my review. I absolutely love fresh cilantro, and use it in salads, sandwiches, and cooking, but the Coriander Leaf Chef Spray was difficult for me. These sound so cool! I have great visions of some of these making great additions to fillings and frostings for cakes. To say nothing of a spray on some ice cream, or on savory food. Yum! Welcome back, you were very much missed! Oh, and in macaron fillings! The possibilities are endless! I thought of you so much with regard to your macaron fillings and your baking. You would LOVE what these did, Kevin. Really love them. I could see you doing wonders with the Rose one, but also the less pricey, more basic ones as well. And lord knows, your Mexican dishes would really sing with some of the spice essences as well. I really hope that you will order some. I think you’d find them really worth-while, and actually quite economical in most cases. Glad you are back, Kafka. I really enjoyed this review. Being a foodie as as Well I really look forward to trying THE blood orange with chocolate ice Cream 😉 these essences must bring so much joy while cooking can’t wait to try them. Thank you for sharing your experiences with us. I’m reading this while eating my breakfast and totally thinking I need to investigate these a bit further. I know fresh is always great but oftentimes it’s just not practical on the wallet to buy all fresh seasonings. I loved dried and frozen stuff for the long storage but they do lose their zip after a bit. I bet these essences are amazing. How many times have I bought a lemon or orange for a recipe that only called for the zest? If I had this stuff I bet I could use it instead. I buy fresh ginger now and then but always end up wasting most of it. When you think about how much ginger or basil or whatever it is that you buy that you end up tossing out the price for these doesn’t seem all bad. I can’t wait for part two and Baking with Kafka. I’m with you on the wasting issue, or how some of these things go bad before you can use it all. Plus, things like ginger can be a real pain to peel and prepare, at least when one is pressed for time. So the convenience factor for someone like me is a huge plus as well. Which one(s) were you contemplating trying, Poodle? I made a custard tart with Mandy Aftel’s Lavender Essence, and it was a huge hit. Thanks for reviewing these; I will probably order a few for the holidays. I’m thinking about making a martini with a little spritz of basil essence. Lavender is a tricky note for me in perfume, but I love it in food and in desserts most of all. I imagine your custard tart was simply fantastic, and I wish I could have tasted it. I’m not just saying that, either. Custard tarts are one of my favorite things, along with custards in general, but a custard tart with an Aftelier essence must have been something else entirely. Your lucky, lucky guests/family! As for martinis, the basil would be super for that. I was thinking that the tarragon might be great with martinis as well, particularly gin ones. I do have quite a bit left! Will definitely try that and get back to you. Seriously hungry now and seriously considering buying at least 1 if not 2. DH and I need to eat more healthily and I doubt even *I* would miss salt with that lovely sounding basil oil. He loves ginger. I doubt he’d miss sugar/fat with that ginger oil which also sounds TD4 and great for everything. Also, thinking about the peru balsam and the frankincense essences … I’m imaging both might be a wonderful addition to the German Christmas cookie Pfeffernüsse. I think a spray of frankincense to the powdered sugar of the finished cookies would make it seem even more Christmas like and enchanting. I’m so glad I could tempt you, sweetheart, especially regarding the Tolu Balsam vanilla-ish essence and the Frankincense. But you know which one made me think of you, in specific? Like, seriously, “I wonder what Suzanne would think of this?” It was the Fir Absolute that the legendary Heston Blumenthal uses in his mango-lychee dessert. That has me quite obsessed actually because its description is: “Jammy sweet and intense, fir absolute is like a walk through the aromatic forest” http://www.aftelier.com/Fir-Absolute-Chef-s-Essence-p/chefs-firabsolute.htm. The reason why the Fir one makes me think of you so much is specifically because of Serge Lutens’ Fille en Aiguilles. I know how much you love that one, and so the Fir Absolute with its jamminess but also its pine and aromatic qualities brought you to mind. I’m so intrigued by its unusual description. I think it sounds like it could go really well with beef, pork, or duck. Lemming alert! I had to buy a set for my foodie sister for Christmas and of course had to get some for myself too. Can’t wait to try them out. I’d love to know which ones tempted you for yourself, but even more, I’d love to hear about the results of your adventures with them. Will you promise me that you’ll come back at some point, if you have the time, to tell me what happens? I can’t WAIT for you to try them out! I absolutely will! I had to get the ginger based on your review. This sounds like something that will be very versatile. Also got the lavender. My sis makes these amazing lavender and sea salt chocolate truffles and the Aftel lavender could take it to another level. Also got tarragon (I already use a tiny bit of tarragon in *almost everything* but fresh is really hard to find) and lemongrass. Whoaaa, your sister’s truffles sound…. damn, I just swallowed my saliva. Does she sell them?! You’re right about how the Aftelier essence would take them to a totally new level. I so agree. Do you really use tarragon in almost everything? I love that. So few people do, it seems. Well, at least amongst those that I know, especially in America. How great that there is another tarragon fan out there. As for the lemongrass, that is also on my list for the next ones to get. Gosh, your sister’s truffles. Lavender, sea salt, chocolate truffles….. WOW! 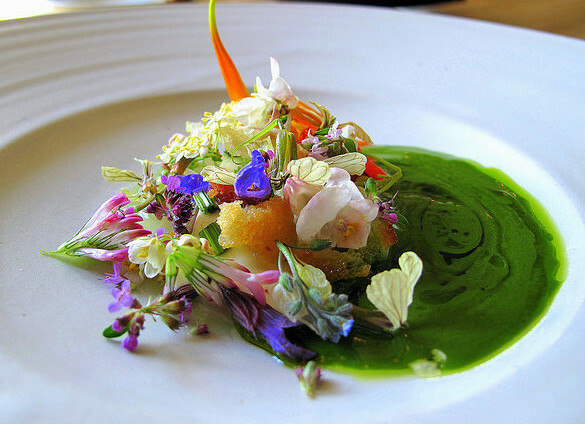 I am so honored, impressed, and grateful for your incredible post about my Chef’s Essences! Thank you for looking so deeply into my work and history and taking the time to write about it so beautifully. I am moved to see you “get” the essences and love their alchemy as I do. I’m also impressed by the level of commentary and discussion you have with your readers – quite a lively, savvy group! The Frankincense as you say is not actually smoky at all – just an association through its historic use as incense, but the true essence is light, citrusy, slightly wood.. I have a very full-bodied oolong tea that I flavor with the Frankincense – kind of a perfect marriage. Peru Balsam does work great with chocolate, actually with so many desserts — Jeni’s Ice Cream blended it with some amber & wood notes for one of her flavors. I loved the description of your baking ordeal, and how you turned it into something delicious in the end! Thanks again for your fantastic writing – a real treasure for me! Dearest Ms. Aftel, I’m so happy you enjoyed the reviews but also that you had the chance to see how many readers here were excited about them. Now, WHAT must we do in terms of begging for you to perhaps consider offering samples of both the sprays and the oils? 😉 😀 I know others would find your adorable minis to be completely irresistable, because they really were the cutest things ever and also permitted me to explore more of your line in a wider way, the way I know others would like to. So, I really, really hope you will take the suggestion under advisement. It is offered with the greatest of respect. And some self-interest as well… 😉 heh. Oh my god, Kafka. This post is a dream — I can’t imagine how incredible it must be to cook with (and enjoy!) these fragrant essences. I’ve lusted after the Aftelier range for years, and your post just makes my craving that much stronger! Hi Anne, welcome to the blog and please accept my apologies for the delay in responding. It’s been a hectic few days with all the year-end stuff. With regard to Aftelier perfumes, I have the same difficulty as you do. The fragrances don’t really work on my skin, either. Plus, I also like a different sort of sillage than what all-natural fragrances create. The recent Palimpsest was gorgeous, though. I just wish it projected on my skin.